Adopted on March 1, 1967. 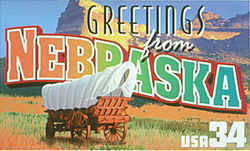 The Prairie Agate became the state rock by legislative action on March 1, 1967 (Nebraska's Centennial). 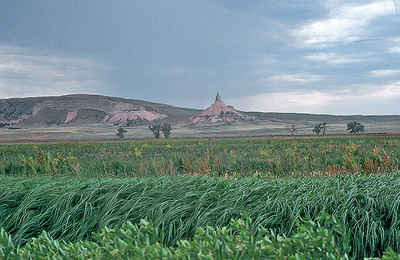 Agate is a semiprecious stone, and Nebraska has an abundance of it, especially in the Oglala National Grassland. 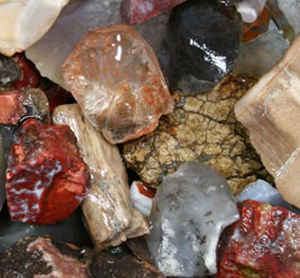 Agate is a variegated quartz noted for its layered varieties. 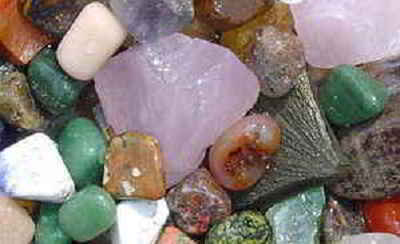 In most specimens, the bands are coarse and differ in color and translucency, as well as in compactness and porosity. The prairie agate, distinguished from most other agates because it seldom has these bands, is still colorful, has a rounded irregular shape and is popular for jewelry. Agate is a semiprecious stone, and Nebraska has an abundance of it, especially in the Oglala National Grassland. 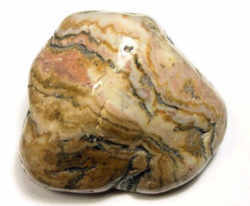 Prairie Agate, the Nebraska State Rock, is found in about the same areas as Fairburn Agate. Prairie Agate does not have the fine banding that characterizes Fairburn Agates, but it can be transformed into very fine cabochons (an unfaceted cut gemstone of domed or convex form). Agate is a variegated quartz noted for its layered varieties. In most specimens, the bands are very coarse and differ in color and translucency, as well as in compactness and porosity. The prairie agate, distinguished from most other agates because it seldom has these bands, is still colorful, has a rounded irregular shape and is popular for jewelry. Agate is the term for banded chalcedony. It is often found as the layers lining geodes deposited in different colors as a quartz geode formed contained different impurities (or even none, resulting in a white or colorless band). As a general term, agate is so broadly descriptive that there are hundreds of names applied to varieties of agate from different localities. While many names reflect the source, some popular varieties are descriptive, such as "blue lace agate". Note that in come cases, the term "agate" is used where the term "jasper" may be more accurate, as in "moss agate" in which a white quartz contains a fractal pattern of green and black, resembling tiny blades of moss. Agate is primarily formed by the deposit of silica from solution; it is also a common method of fossilization, as the organic remains of some living thing are gradually replaced by quartz. "Agatized coral" from the Tampa Bay area is an excellent example, as are all of the specimens of petrified wood. 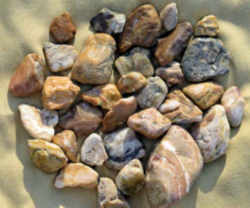 USES: Gemstone and ornamental stone. Chalcedony is the generic name for "cryptocrystalline quartz", meaning the individual crystals are too small to see. The law designating the prairie agate as the official Nebraska state rock is found in the Nebraska Statutes, Chapter 90 (Special Acts) Section 90-114. 90-114: State rock; prairie agate. The chalcedony stone, commonly known as prairie agate, is hereby declared the state rock of Nebraska.